1. Easiest of all – simply save them til next year. 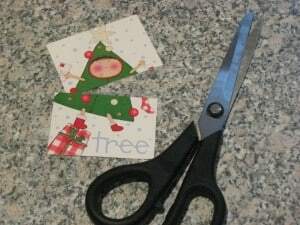 Stash them away with your Christmas decorations and then come Christmas 2010 you’ll have a pile of cards ready for your children to cut, stick and craft with. 2. 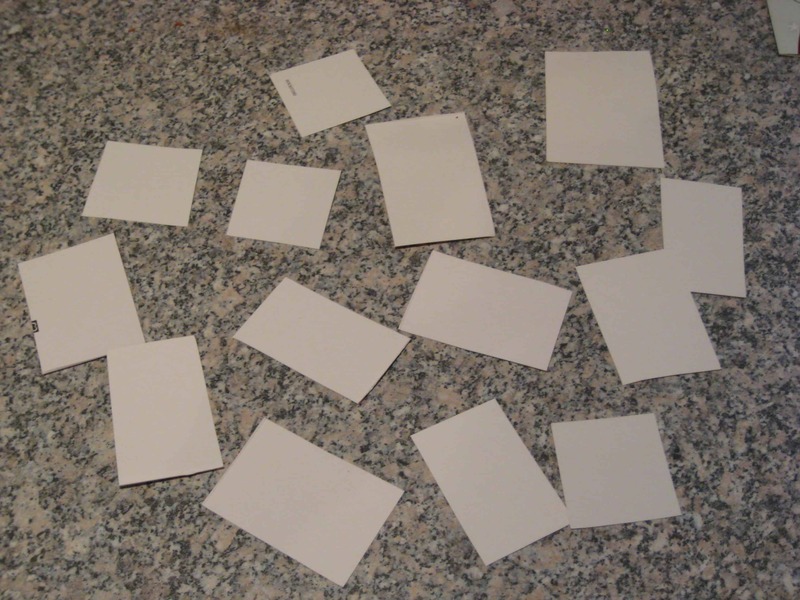 Make a memory game. You can make a ‘match the pairs’ game which will help develop your child’s memory and turn-taking skills. 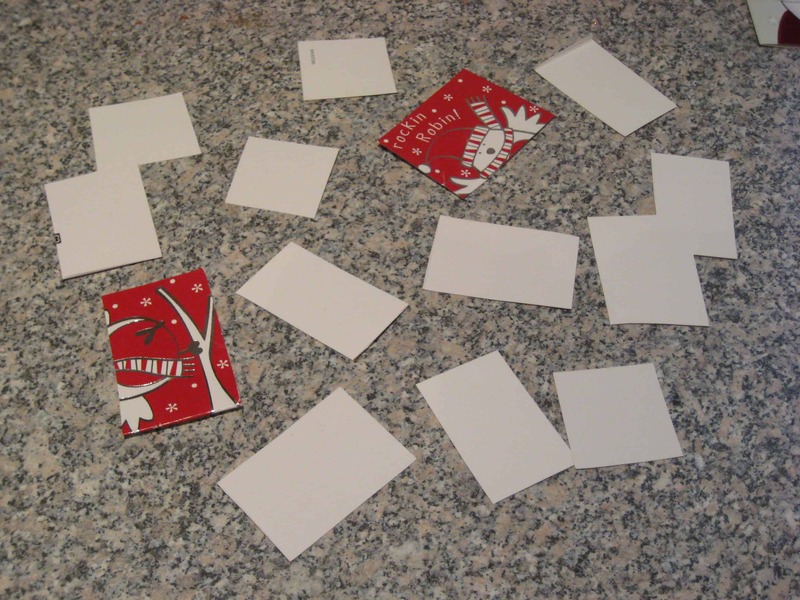 This works best with card which are all of a similar size. 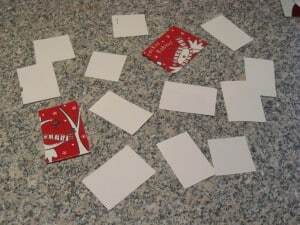 Depending on the age of the children playing it is probably best to select cards which are distinctive: in the picture above you can see I’ve chosen a card which is mainly white, one which is mainly green, one which is mainly purple , and so on. I’m playing with a 3 yr old so want to give her some fairly easy ones to match together. With older children you can make them more difficult. 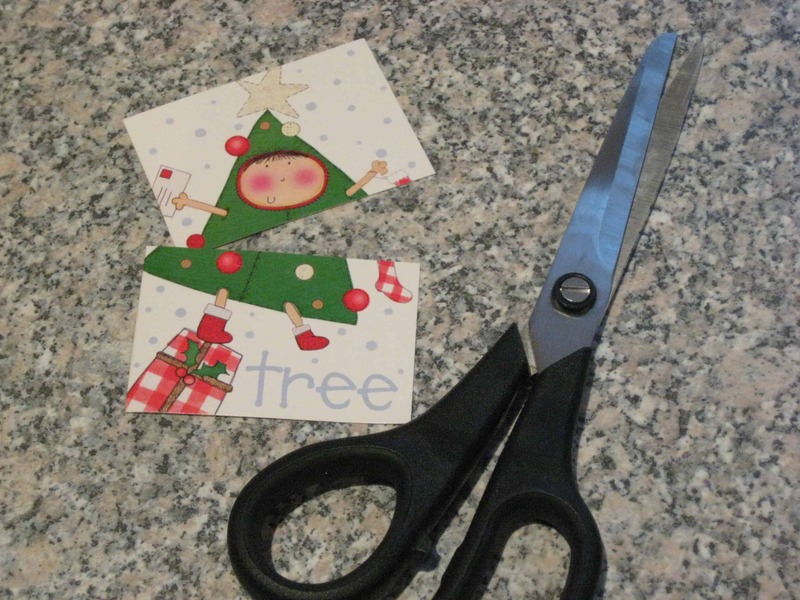 Using just the front of each card, cut them in half. Jumble them up and place them face down on the table or floor. Now you’re ready to start playing. Player one turns over 2 of the cards. If they match, they can keep the cards. If they don’t match, they have to be turned back over. Player 2 has a go. Keep alternating turns, collecting any cards which match, until all the pairs have been matched up. They player with the most pairs is the winner. What you’re encouraging your child to do is develop their visual memory so they can remember when the matching pairs are, so they can turn them over when it’s their turn. Of course, especially with younger children, you can give a few clues to help them – it’s about having fun and developing a skill, rather than getting frustrated because it’s too hard. 3. Alternatively why not make some jigsaws? 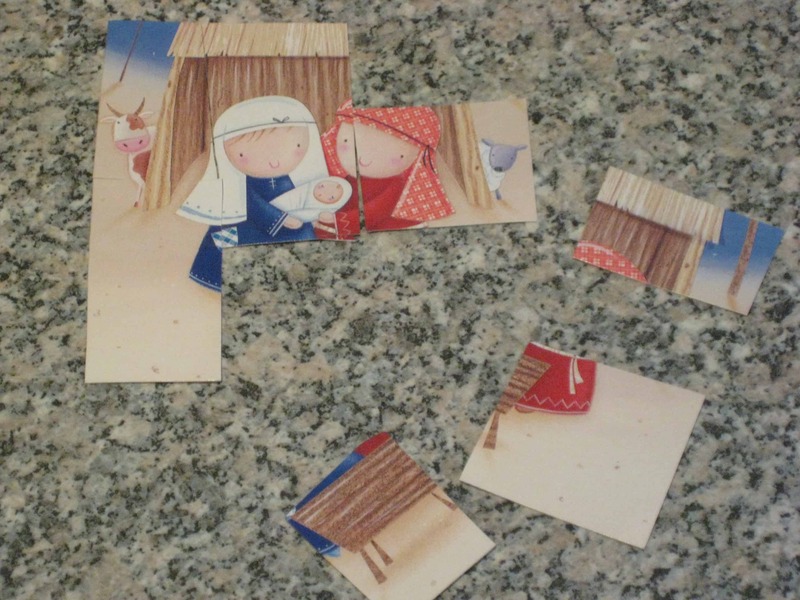 For young children, this works best with cards which have a recognisble picture rather an abstract design. You’ll see we used a Santa card and a nativity scene. All you need to do is cut up the card, jumble the pieces and let them jigsaw away to make the picture again (and again and again and again in the case of my currently jigsaw-crazy daughter). This is a fantastic idea!! I am LOVING your blog… there is SO much here to see and implement and enjoy!! THanks for all your wonderful posts! wonderful ideas – thanks for sharing and for adding the great photos! 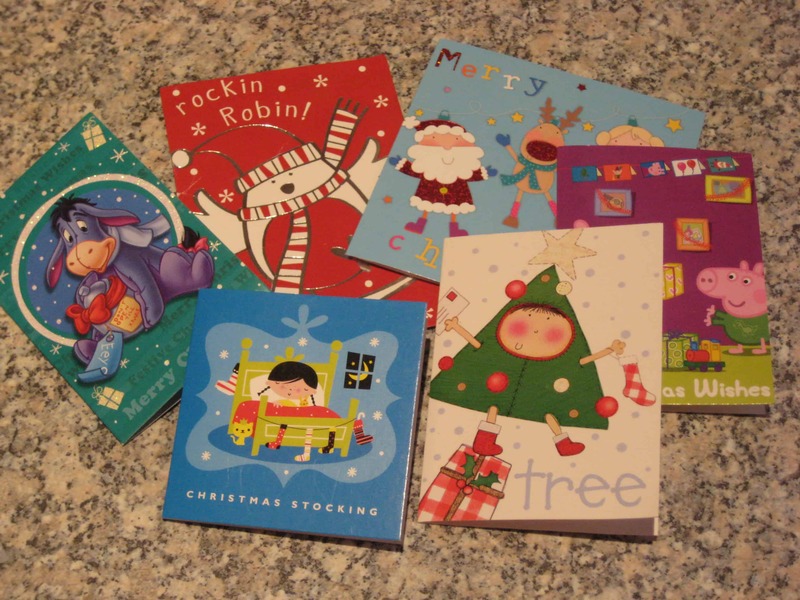 Great ideas here – I will pass them on to my daughter for her little girl but will also keep some cards in the toy box I keep for the grandchildren’s visits. Happy 2010. I love this idea too! I save my old Christmas cards hoping to use them!! Too Cool! 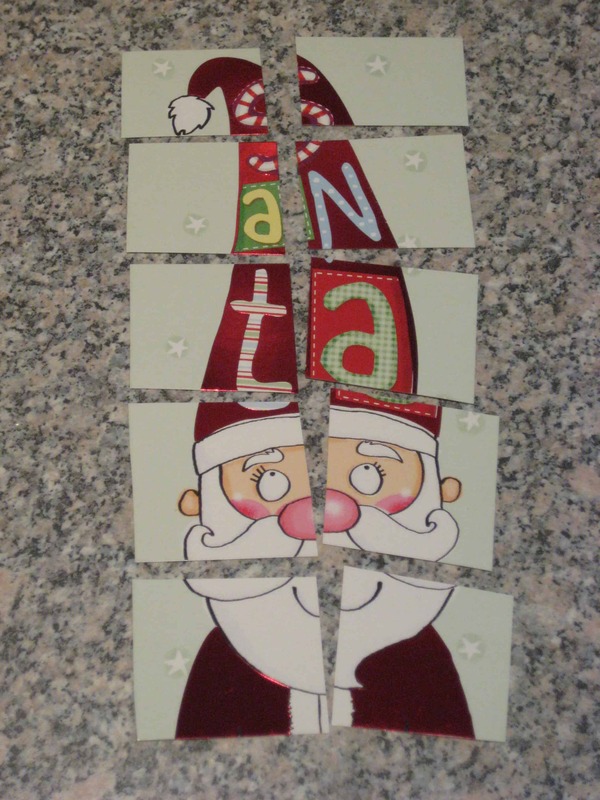 My daughter will love this puzzle idea!